Unashamedly earnest and heartfelt, Greg Berlanti's Love, Simon is a sweet and entertaining coming-of-age film, effortlessly tapping into the confusion, anxieties, and joys of adolescence. Expanding upon classic teen romance flicks of the past, the film fully takes its tried-and-true genre into the 21st Century. A fantastic 4K HDR10 transfer offers a nice upgrade over the standard Blu-ray, while the same solid audio presentation and supplements are carried over. Recommended. We have also reviewed this film on Blu-ray. "Everyone deserves a great love story." That's the tagline written on the poster for director Greg Berlanti's Love, Simon, and I'm not sure there's a better way to sum up the film's ultimate message than that. Based on the book written by Becky Albertalli, the movie presents a sweet and sincere examination of high school romance and adolescent struggles. As the first major studio rom-com to focus on a gay teen relationship, the film represents an important milestone. But even beyond the movie's significance within the industry, this is just an effortlessly great coming-of-age flick through and through. 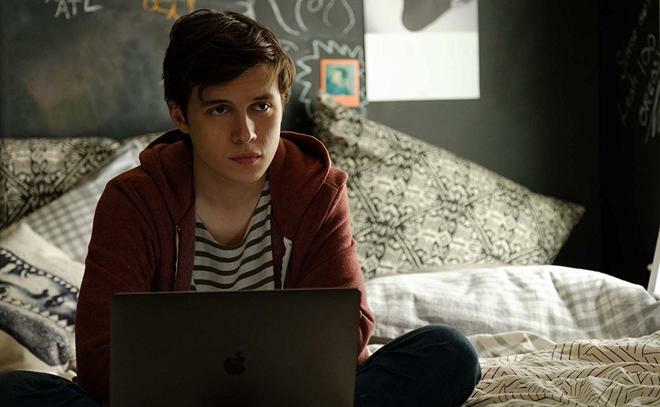 Simon (Nick Robinson) is an affable high school senior with a supportive family and great friends. But despite his seemingly carefree life, he remains hesitant to tell his loved ones that he's gay, fearing the change the revelation about his sexuality might bring. When another male student at his school anonymously comes out through an online blog under the pseudonym "Blue", Simon starts up an email exchange with his classmate. Though they both keep their real names a secret, the two soon develop a genuine connection and Simon sets out to try and discover the real identity of his newfound crush. But when their emails are accidentally discovered, the pair's blossoming romance is threatened, placing Simon's chance at love in jeopardy. Offering a fitting internet-age spin on otherwise tried-and-true teen-romance plotting, the search for Simon's online secret admirer becomes an engaging drive for the story, and the filmmakers have some fun conveying the emails in a cinematic way. To this end, we're treated to fantasy sequences and voiceover narration of Simon's messages, providing an organic window into his thoughts as he imagines Blue typing his responses back. And as Simon suspects different classmates throughout the runtime, the director playfully inserts these potential candidates into Simon's daydreams, visually shifting our perspective of Blue as we narrow down his real identity. And as that mystery comes closer and closer to being solved, Simon goes through a journey of self-discovery, learning how to embrace all the aspects of his own identity openly. But while there are indeed conflicts and anxieties related to this arc, the filmmakers take a comparatively light approach to the subject matter. On that note, there's just something irresistibly earnest and open-hearted about the whole affair that makes the film a genuine joy to watch. From its catchy soundtrack and peppy style to its amusing sense of humor and exceptionally likeable ensemble, the movie takes all the best aspects of John Hughes-era teen comedies and pushes them forward just enough to come away with something that feels fresh while still carrying clear influences. With that said, there are times when the film's unabashed feel-good sincerity can come close to diluting its drama. But thankfully, the director ultimately avoids an overly saccharine or sanitized feel, offering some intermittent bite to some of Simon's struggles and depth to his group of friends. Though the core gang features some of the most good-natured teens I've ever seen on the big screen, they all rise above stock archetypes, revealing realistic motivations and vulnerabilities. The scenes where they simply hang out together are some of the movie's strongest, and by the time the climax rolls around, the characters' relationships have gone through genuine growth, making the finale all the more satisfying. 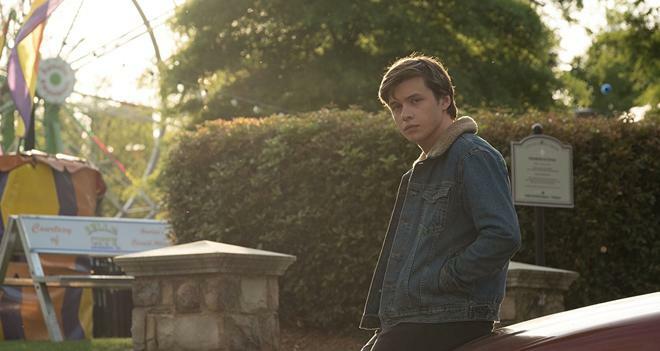 An inclusive teen rom-com for the 21st Century, Love, Simon whole-heartedly fulfills the promise of its tagline, offering an irresistibly endearing and genuinely great love story. Sure, it might repeat some familiar genre beats and the tone is a bit breezy at times, but this earnest and nostalgic approach only heighten the film's charm -- tapping into all the warm and fuzzy and nervous emotions of blossoming high school romance. 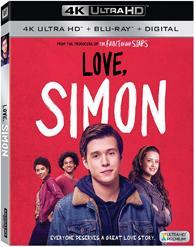 20th Century Fox presents Love, Simon on a BD-66 4K Ultra HD Blu-ray disc housed in a keepcase with a cardboard slipcover. A Blu-ray disc and instructions for a MoviesAnywhere Digital Copy are also included inside. As of press time, the digital code only seems to redeem in HD. After some warning and logos, the disc transitions to a standard menu. The movie is provided with a 2160p HEVC/H.265 encode in the 2.39:1 aspect ratio with HDR10. Besting its already great Blu-ray counterpart in almost every way, the Ultra HD presentation offers a nice upgrade with a colorful and impressive image. Though reportedly shot in 2.8K with an Arri Alexa XT, it's not clear what resolution the film's digital intermediate was finished at. Either way, the source material is being upscaled to some degree, but the resulting image still offers a solid gain in fine detail over the HD disc, providing a sharp image with a nice sense of fine texture in faces and clothing. Likewise, delineation between intricate patterns and small nuances in background objects like leaves on trees and bricks in walls appear more refined and pronounced here than on the Blu-ray. With that said, the film's grain-like noise is heavier and more apparent in 4K during a few scenes than it is in 1080p -- though never enough to be a detriment to the viewing experience. Meanwhile, the transfer's HDR10 WCG grading offers a cheery palette with bold primaries. Reds and greens are particularly punchy at times, offering some pleasing pop with a deeper and more vibrant look than the Blu-ray without falling victim to any exaggerated harshness or bleeding. Instead, the wider gamut offers a more natural, extended range of colors, lending more nuance to all the film's varying hues. The HDR also results in bright specular highlights, giving the image an impressive sense of dimension. Nighttime scenes with colorful lights, like during a Halloween party and a carnival, are the most striking, giving off a pleasing incandescent glow while maintaining deep blacks. Visible details in highlights are also a bit more pronounced here than on the SDR Bu-ray -- particularly during an early scene where Simon looks out his bedroom window. On the Blu-ray, the outside light causes Simon's face and the view outside to look a little blown out and overexposed, but in HDR the contrast is balanced better. With that said, some shots do look darker in HDR than SDR, particularly a few during a Halloween party. And though this does give the image an inkier look, some background details are actually harder to see. Still, the overall improvements outweigh the minor loss in shadow delineation. Marked by pleasing clarity, deep colors, and bright HDR highlights, this is a strong 4K Ultra HD video transfer, expanding upon the 1080p SDR presentation in all the right ways. The film is presented with an English DTS-HD MA 5.1 track, along with several foreign language audio and subtitle options. Though a bit front-loaded, this is a punchy and engaging mix that suits the content very well. Dialogue is clear and full-bodied throughout, but speech in one outdoor scene at a football game does have a faintly thin quality (likely just a result of the recording environment). General ambiance is solid, spreading background clatter throughout classrooms and halls. With that said, surround presence is a little muted. Key effects, like tussling sets and props during a rehearsal for a school play, hit the rears with emphasis, but the surrounds are mostly relegated to faint atmospherics. Directionality is solid across the left and right soundstage, however, and the movie's fantastic pop soundtrack comes through with nice separation and range. Bass also kicks in nicely during certain song choices and a booming Halloween house party. Though it could be just a bit more immersive at times, the track offers an effective and lively experience in tune with the film's upbeat yet comparatively limited scope. 20th Century Fox has assembled a solid collection of supplements, including a commentary track and a few featurettes. All of the extras are presented on the included Blu-ray disc only, with the exception of the commentary track which is also provided on the 4K Ultra HD Blu-ray disc. Audio Commentary – Director Greg Berlanti, producer Issac Klausner, and co-screenwriter Isaac Aptaker sit down for this track, offering an affable and informative discussion. Though there's nothing particularly eye-opening shared here, the group touches upon the adaptation process, casting, the soundtrack, and the movie's visual style while providing a few amusing bits of trivia here and there. Deleted Scenes (HD, 8 min) – Two deleted scenes are presented here viewable separately or together, including a sequence where Simon lies to Abby about Nick's history with women, and a scene featuring an amusing trip to a gay bar. While good on their own, these were wise cuts. The Adaptation (HD, 11 min) – This is a brief behind-the-scenes featurette with cast and crew interviews focusing on the source material and how the filmmaker's tried to visualize certain aspects of the book. The Squad (HD, 10 min) – More cast and crew interviews are provided here, this time focusing on the film's ensemble. #firstlovestorycontestwinner (HD, 2 min) – As part of the movie's promotion, the filmmakers held a short film contest for stories about first love. Included here is the winning entry along with an intro from Greg Berlanti. Dear Georgia (HD, 5 min) – In this featurette, the cast and crew talk about the shooting locations in Atlanta, Georgia. Dear Atlanta (HD, 2 min) – More praise for the film's shooting location is offered here. Gallery (HD) – Here we get a collection of production stills and behind-the-scenes photos. Theatrical Trailers (HD, 4 min) – Two trailers are included. 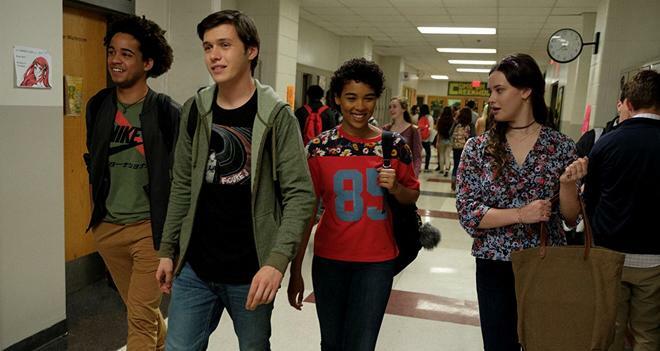 Greg Berlanti's Love, Simon is an earnest and heartfelt teen rom-com, offering an updated, inclusive take on classic genre beats. The 4K HDR10 video transfer is great, providing a nice upgrade over the already pleasing HD presentation. Likewise, the audio mix is very good considering the movie's modest scope. Though not packed with extras, the release includes a worthwhile commentary track and some featurettes. Sweet and effortlessly entertaining, this is a genuinely well-made and crowd-pleasing coming-of-age flick. Recommended.